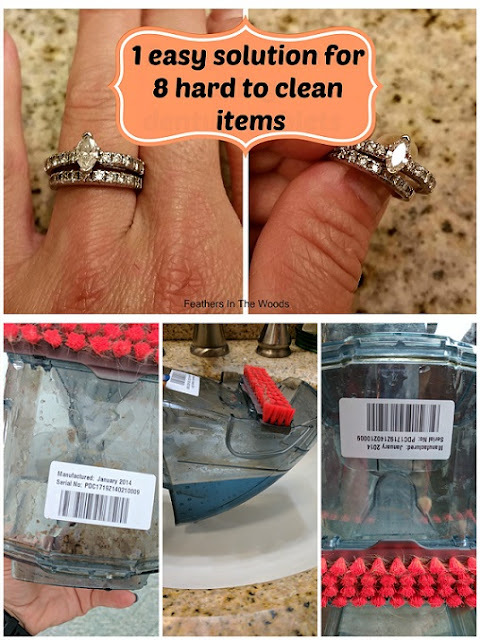 Have you ever had an item that no matter what you tried, you just can't figure out how to clean it? It all started a few months ago when I was trying to clean a vase out. I had tried just about every brush and solution I had to clean it but I just couldn't reach down the narrow neck into the larger bottom to get all the scum out of it! Without being able to scrub it, the residue just sat there glued to the sides. Forever. After soaking it for hours and trying to scrub inside with a toothbrush, my daughter who used to work in a floral shop told me to use denture tablets. Huh? I tried it, it worked and I decided to figure out exactly what else I could use it on. Lo and behold, I've discovered a bunch of uses for these lowly denture tablets! Denture tablets were designed to clean and disinfect the tiny nooks and crannies of dentures but they can do the same thing for many difficult to clean items in your household. Not only are they good at cleaning, but their intended to go on a mouthpiece that you simply rinse then put in your mouth. 1) Clean diamond jewelry (not silver or pearls though): Drop a denture tablet into a cup of warm water and add jewelry. Let sit until the fizzing stops then rinse clean. 2) Clean the water reservoir in rug scrubbers. Fill with very warm water and add a few denture tablets. Let sit till the fizzing stops and rinse. 3) Get rid of mineral stains in the toilet: Pour a pitcher of hot water into the toilet bowl. Drop 2 tablets in the bowl, wait 20 minutes and flush. 4) Dissolve scum and residue inside vases: fill with warm water, drop in tablet and wait about 20 minutes then rinse clean. Works on thermoses and stained coffee cups too. 5) If your shower head is caked with mineral deposits remove it and place it in a glass bowl with 2 cups of hot water and 2 denture tablets. 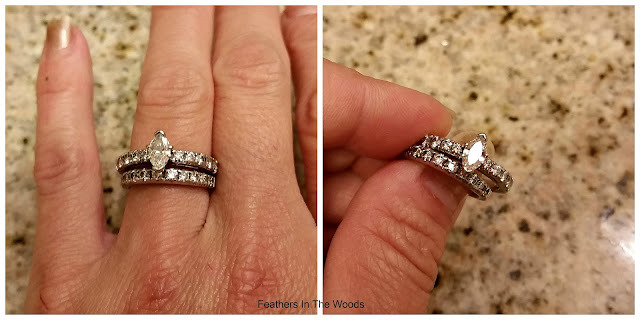 Allow to soak about 20 minutes then scrub clean with a soft brush. 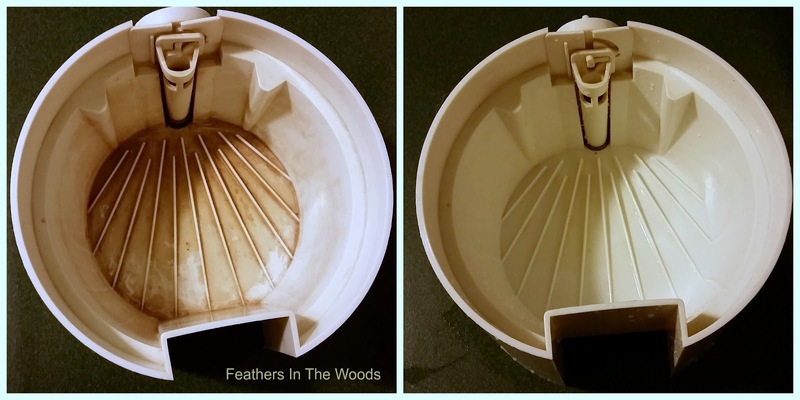 6) Coffee or tea basket: I used denture tablets to clean the tea basket of my iced tea maker. It was stained from use but no matter how I tried I could not get a brush into the tiny slots to clean it. I just poured 1 cup of hot water in and added 1 denture tablet then rinsed when clean. No scrubbing required. 8) Hairbrushes: Have a brush with residue on the bristles from hair products? First pull the hair out using a comb. Then put 2 cups of warm water in a bowl, add the hairbrush and drop in 2 denture tablets. Let it sit till the fizzing stops. Rinse brush well and let dry. You can use cold water in places that have standing water like the toilet or sink, but it doesn't work as well as when you pour in hot water first. I used plain old Efferdent tablets. I didn't try the whitening or 'with Scope' because they were more expensive. I just bought the plain ones, but I did get the big box and they will last a long time. Want more posts on cleaning without chemicals? Click here for my other posts on green cleaning! Is the used denture tablet cleaning solution water safe to pour on plants? No, it's not safe for plants. It has sodium in it which would be harmful to the plants.